Everything we do at ES&A Financial Services is based on seasoned research developed through 33 years of experience in assisting clients with carefully considered financial planning. We teach our clients how to ascertain what degree of certainty there is in the investment process and how to harness that information to create wealth. Through education our clients learn how to reach their maximum financial potential and many of them discover how to overcome their ‘perceived’ limitations and thus go on to become naturally wealthy. Our advisers have a vested interest in looking after you because the advisers are also the ‘owners’ of the business. Our financial advisers are senior in that they not only have extensive years of industry experience under their belt but they all hold university degrees – with Julie Schafer & Greg Evans both holding a Mastersn Degree. I have been in the financial services industry for over 20 years. I love helping clients to make smart choices about their money so they can fulfill their hopes and dreams. I believe in taking the time needed to form long lasting and deep connections with my clients as we get to talk about what is truly important to them - and that is truly important to me. I enjoying working as a team with Clients and the other important Advisers they need on their side. We believe education is the key to helping our Clients and that we should never stop learning. Greg Evans is pleased to have joined ES&A after 30 years working in senior Finance and General Management roles for large Corporates including Brisbane City Council, Ergon Energy, Qantas, Coal & Allied and CBA. Greg has both a Masters and Bachelor degrees in Finance related disciplines and is a Fellow of Certified Practicing Accountants and a Member of the Australian Institute of Company Directors. Greg is looking forward to bringing his knowledge gained from his roles as Chief Financial Officer at Brisbane City Council, (Australia’s largest local government), and Ergon Energy, and senior Corporate Finance and Strategy roles at Qantas. His knowledge of Accounting, Treasury, Financial risk management and strategic planning will be of great benefit to us at ES&A. Some of Greg’s key achievements during his career include.. Refinanced Brisbane City Council’s debt which lead to a credit rating upgrade post the GFC (Australia’s only Government to achieve this). Implemented a major back-office system at Brisbane City Council (SAP) which was completed on-time, under budget and delivered benefits in excess of the business case. Refinanced Ergon Energy’s debt during the GFC which delivered financial security to Queensland’s regional electricity company. Lead the strategic planning processes at Qantas which saw five years of profitable growth. Developed the financial plans for Qantas which were the basis for its prospectus for its float. Managed the Treasury function at Coal & Allied which included a $600million foreign currency and $500million debt exposures. Away from work Greg is passionate about his family, photography and sport, particularly Rugby Union (Wallabies, Wales and Reds) and the mighty Richmond Tigers in AFL. Ellen is the original owner of Ellen Schafer & Associates (ES&A). Ellen began her Financial Planning practice in 1985 and retired in 2012. She is succeeded by her daughter, Julie, who worked beside her for 14 years. 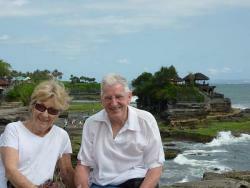 Ellen and husband Kevin, divide their retirement days between their home in Buderim and their villa in Ubud, Bali. Ellen who lives to write and paint, now has the time to indulge those passions in picturesque Ubud, the original artist colony in Bali. That is, when she is not doing volunteer work for one of the local charities to benefit the children of Indonesia. Ellen still has a keen interest in the success of her daughter's business and her wealth of experience is a precious resource that Julie enjoys tapping into from time to time.